New York City’s experimental duo TALIBAM! team up with fluxus artist / electronic avant-gardist YASUNAO TONE and trombonist SAM KULIK for a confrontational sonic attack, fired by an array of analog synths and other electronic devices. 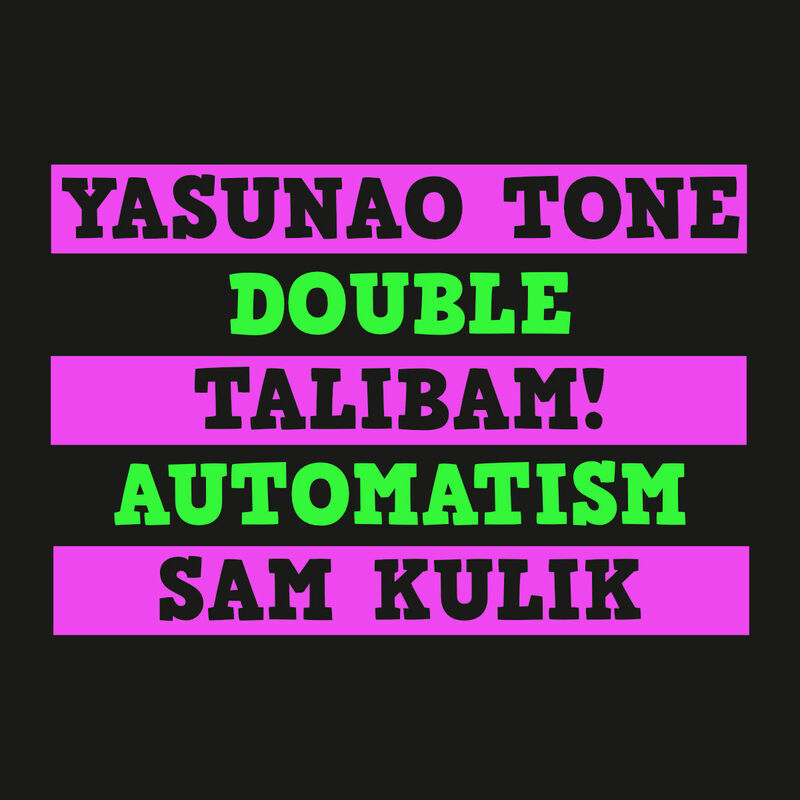 The idea for “Double Automatism” was born in 2012 when TALIBAM! and SAM KULIK were invited to interpret YASUNAO TONE’s graphic scores and game pieces as part of the Japan 1955-70 avantgarde exhibition at the Museum Of Modern Art in NYC where they met the fluxus / electronic artist and immediately developed a mutual affinity for each other. Six months later the trio invited TONE (born 1935) for a recording session – KULIK on trombone, MATT MOTTEL on his Roland Alpha Juno 1 analogue synth, KEVIN SHEA (also drummer in MOSTLY OTHER PEOPLE DO THE KILLING) on electronic MIDI mallet percussion and TONE using his self-developed MP3 Deviations on his notebook. The 2 epic pieces on “Double Automatism” not only continue TALIBAM!’s enduring explorations of new musical territory beyond genre-limitations, the album is also a forceful testimony of TONE’s unique artistry that was documented by recent collaborations with RUSSELL HASWELL or FLORIAN HECKER (all on EDITIONS MEGO) and solo works on TZADIK or ASPHODEL.